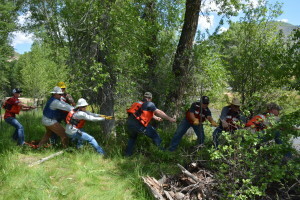 It took a couple of tries for the mass assembly of law, fire and health workers to wrangle a water-channeling boom across the raging Duchesne River in an early June deployment exercise, admitted Linda Lefler, the Duchesne area manager for the Central Utah Water Conservancy District. Hopefully, Lefler added, they’ll never have a spill to deal with on the Duchesne River. It diverts into Starvation Reservoir, which provides drinking water to more than 6,000 people in Duchesne County. The way to effectively deal with whatever comes their way, she said, is to develop relationships between the different departments now and open the lines of communication that are vital to a quick response. The skirted containment and absorbent boom has been placed at several locations in Utah, Wasatch and Duchesne counties. Time is critical given the river’s rapid current, Lefler stressed, and the district will again work with the Duchesne County Emergency Manager and its fire and sheriff departments, the Tri-County Health Department and Chevron Pipeline employees to prepare for the day everyone hopes will never come.